Nothing can make a statement as much as a good rug! Take the time to purchase the best that you can and allow it to take center stage in a room! We love the palette of this beauty! Use those treasured items to tablescape! We love mixing items such as silver, China, seashell, roses, fern from the yard and a variety of other gathered items! Decorate and indulge! Why is shopping local best? Face it, we live in a time of online, and as convenient as it sounds, it's not always the best. For example, many items online are not cheaper and most of times are of less quality. Online stores do not promote local growth...how can a town survive without small business. Shopping local helps the community..when merchants make money, they then can promote and assist with causes. Merchants have the ability to donate financially. It makes a town special and unique..big boxes are everywhere, go for something different! These are a few reasons why. Shop local, dine local, be local! Come see us and check it out! We love working with folks to create florals! We are happy to use your container, or choose on in the shop!!! We love layering accessories the same way one layers clothing! Don't be afraid to gather the refined with the more relaxed! Here we have layered dried boxwood, Asian vases, simple seashell obelisk, and a Moroccan charger! Go for it! These wonderful paintings play on motifs that appear in our neck of the woods! Frame one up in natural wood or a gallery frame! Artist Stephanie Wilson has created fun pieces with local flair! Keep the classic and add a bit of funk! We love this vintage wallpaper! Use pattern! Don't be afraid! Who says one or two patterns to a room! We love this room designed by Megg Braff! The use of pattern, color, and texture really brings warmth to the space! Go for it! The season of entertaining is in full swing! Mass those wine glasses and appetizer plates! Throw a party! Bienvenue Home is an excellent resource for home decor, birthday and wedding gifts! From gentleman to lady, we have something for all! 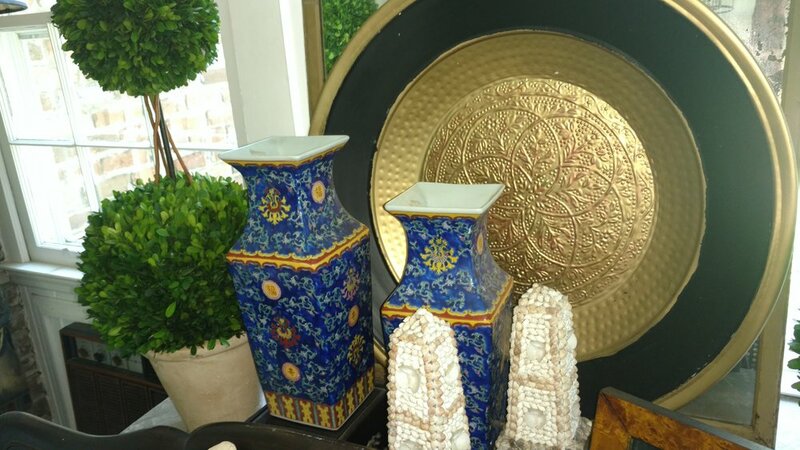 A Statement piece with a cultural influence really adds to a space! We love this woven mirror! Imagine this in a tonal room as the focal or on terracotta walls for warmth! Make a great statement with a small wonder! Pictured is a small vase purchased in Italy with gardenias from the garden...Little touches make the house a home! Add a taste of tropical! Summer is a wonderful time to add a signature tropical piece! A painting, a pillow, or a big palm bowl! Think Hollywood 1940's! We adore vintage rattan and bent wood, mixed with pops of tropical flair!! Go for it! Add a mantle in a rich color! I love the mix of color in this pic! I wish I could see the rest of the room!! By adding a bit of color to a feature such as a mantle, you can create what I call the "pow" to a room! We love adding contemporary to a traditional space by adding natural elements! These panels in wood are just the ticket! We love our new "smashed" glass bowls and trays! Completely made out of broken car wind Shields ..Add the unexpected for a surprise! Buy 1 good piece for each room! Anchor a space by purchasing 1 good piece, the best you can do! By adding in quality new or antique, you are investing in not having to reinvest often for furniture that will not last the test of time.. I suggest a good dining table or China cabinet...A good cabinet for the living areas, and a good dresser. Add trend with easy lamps, accessories, and wall color! A classic Tulipere! Used historically for Tulips but here we use for Hydrangeas! A stem in each opening and voila!!! A fabulous centerpiece! When in doubt?! Blue and white! If having trouble creating a "look", start with beautiful blue and white! It works with every palette, from crisp white to dramatic black! Start a collection today!